You'll be £12.99 closer to your next £10.00 credit when you purchase A History of Courtship. What's this? Explore eight hundred years of lust, love, and loss. The author takes the reader on a journey from medieval Courtly Love, through to the sexual license of the Restoration, and Victorian propriety. Pick up historical 'dating tips', from how to court (or be courted); write romantic love letters, give and receive gifts, propose and pose as a sighing swain. A historical approach to the problem of finding a mate, with case studies of classic romantic mistakes and plenty of unusual tales. In the 14th century young men tried to impress the ladies with their footwear, donning shoes with pointed toes so long that they had to be secured with whalebone – presumably because size mattered! While this book read a bit like a research paper, I did learn quite a few fun facts and historical antecdotes regarding love and courting. I enjoyed the illustrations which highlighted some of the points that were addressed in the book. An entertaining romp through some of the more intriguing aspects of courtship. Tania O'Donnell's amazing study of love and courtship through the ages is a delight and an eye-opener. Students of the art of seduction and wooing will lap this up! 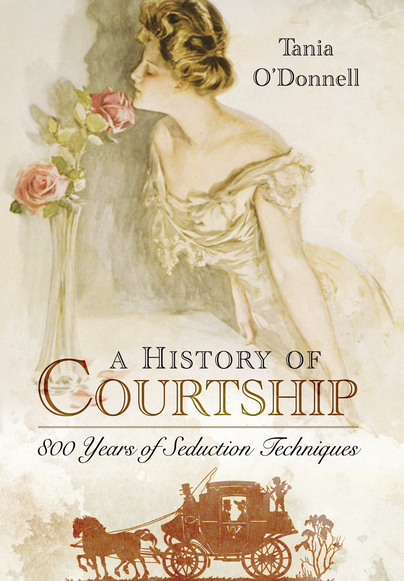 Interesting book on the history of courtship. Will read more from the author. This was an easy and fun read. It clarifies some misconceptions we have today about how love and relationships were conducted in the past. I was especially interested to note how common sense was the basis for choosing a life partner, much more so than today. Similar backgrounds and social standing aren't entirely bad ideas. I know we think opposites attract, but can they make a life together? The Victorian considerations regarding finances wasn't the "gold digger" notion that we tend to have today. It was a genuine concern and so it should be. Love don't pay the rent, as the saying goes. Recommend! Overall, I'd recommend this interesting and entertaining book. This book would be suitable for a light read and I would recommend looking at some of the references that author Tania O’Donnell has written about throughout if this is a subject that intrigues you. A History of Courtship was very interesting. Courtship use to be an art form but now is just a mess of apps and websites. It is amazing how Courtship have changed throughout time. TANIA ODONNELL has written on relationships for national newspapers and magazines, including Metro and the Guardian. She is the founder of Green Cover, a private press that publishes collectible editions of original short stories, poetry and mythology. She lives in South London with her husband, Gary, and a Westie puppy that Gary is unaware hes about to get for her.